Im from a big Irish family, which is cool. My parents had seven children, but I dont think they wanted seven kids. Theyre Catholic, so that means they love Jesus and hate four of us. 1.On a Sears hairdryer -- Do not use while sleeping. 2.On a bag of Fritos -- You could be a winner! No purchase necessary. Details inside. 3.On a bar of Dial soap -- "Directions: Use like regular soap,"
4.On some Swanson frozen dinners -- "Serving suggestion: Defrost." 5.On Tesco's Tiramisu dessert (printed on bottom) -- "Do not turn upside down." 6.On Marks & Spencer Bread Pudding -- "Product will be hot after heating." 7.On packaging for a Rowena iron -- "Do not iron clothes on body." 8.On Boot's Children Cough Medicine -- "Do not drive a car or operate machinery after taking this medication." 9.On Nytol Sleep Aid -- "Warning: May cause drowsiness." 10.On most brands of Christmas lights -- "For indoor or outdoor use only." 11.On a Japanese food processor -- "Not to be used for the other use." 12.On Sainsbury's peanuts -- "Warning: contains nuts." 13.On an American Airlines packet of nuts -- "Instructions: Open packet, eat nuts." 14.On a child's Superman costume -- "Wearing of this garment does not enable you to fly." Funny video of the day Wednesday, 14 April 2010 - link to page video is posted initially. Joke | Source: Daily Jokes - A Clean Joke Everyday! An Albertan's favourite movie? Tarsand. On The Horizon | Source : This is Photobomb - Photojackers of the World Unite! It was a blondes first day at the office. Her first task was to go out for coffee. Eager to prove her worth to her new bosses, she grabbed a large thermos and hurried to the nearby coffee shop. counterman could view it, and she asked, "Is this big enough to hold six cups of coffee?" The counterman looked at the thermos and replied, "Yes. It looks like about six cups to me." "Oh good!" the blonde sighed in relief. "Give me three regular, one black, and two decaf." 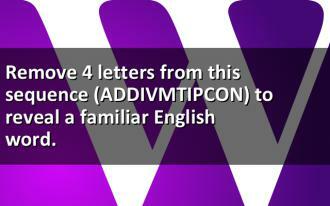 Remove 4 letters from this sequence (ADDIVMTIPCON) to reveal a familiar English word. A rabbi, a Hindu and a lawyer were driving late at night in the country when their car broke down. They set out to find help and came to a farmhouse. When they knocked at the door, the farmer explained that he had only two beds, and one of the three had to sleep in the barn with the animals. The three quickly agreed. The rabbi said he would sleep in the barn and let the other two have the beds. Ten minutes after the rabbi left, there was a knock on the bedroom door. The rabbi entered exclaiming, "I can't sleep in the barn; there is a pig in there. It's against my religion to sleep in the same room with a pig!" The Hindu said HE would sleep in the barn, as he had no religious problem with pigs. However, about five minutes later, the Hindu burst through the bedroom door saying, "There's a COW in the barn! I can't sleep in the same room as a cow! It's against my religion!" The lawyer, anxious to get to sleep, said he'd go to the barn, as he had no problem sleeping with animals. An American stood in London looking at a large building. A British boy walked by and stood beside the American. "You know, boy," said the American, "in the States we have that kind of building too, but they are four times higher." "Really?" replied the boy. "How sad. That is a mental hospital." Three girls were ascaping from jail and were being followed by the cops. One was a brunnet, one was a red head, and the other was a blond. 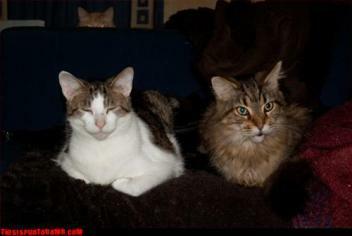 They saw an abondend barn and decided to go in there to hide. They saw 3 potatoe sacks and decided to hide in them. When the cops came in the decided to tap each sack to make sure they wern't in them. The first sack they tapped had the brunnet in it and she yelled," Meow! Meow!" The cops thought it was a cat and moved on to the 2nd sack with the red head in it. When they tapped it she yelled,"Woof! Woof!" The cops thought it was a dog and moved on to the 3rd back with the blond in it. The cops and the blond yelled back," Potatoes! Potatoes!" When I was born, the doctor took one look at my face, turned me over and said, "Look ... twins!" A bishop, a boy scout and the Brain of Britain were passengers in a small plane. The pilot announced serious trouble and asked everyone to leave the aircraft. However, there were only two parachutes, so the bishop suggested that as he was the oldest, he should stay behind. The scout said: "Don't worry sir! There are still two parachutes. The Brain of Britain has jumped using my haversack!" One night, a man on his way home happened upon a drunk, down on his hands and knees searching for something under a street light. The man asked the drunk what he was looking for so diligently and the drunk said he had tripped and his Rolex wrist watch had broken loose from his wrist. The man, being a kindhearted soul, got down on his hands and knees and began assisting the drunk looking for his watch. After about ten minutes without any success, the man asked the drunk exactly where he tripped. "About a half a block up the street," the drunk said. "Why, pray tell," the man asked the drunk, "are you looking for your watch here if you lost it a half a block up the street?" The drunk replied, "The light is a lot better here." In the pre-Thanksgiving rush, we have received an early weather report from our in-house weather reporters. This is one you should be sure to email to your Mom. Turkeys will thaw in the morning, then warm in the oven to an afternoon high near 190F. The kitchen will turn hot and humid, and if you bother the cook, be ready for a severe squall or cold shoulder. During the late afternoon and evening, the cold front of a knife will slice through the turkey, causing an accumulation of one to two inches on plates. Mashed potatoes will drift across one side, while cranberry sauce creates slippery spots on the other. Please pass the gravy. TV star Jonathan Ross has been caught shoplifting in Harrods' kitchen department. The controversial chat show host told police it was a whisk he had to take. Jim calls out to Bob in an agitated voice, Hey Bob, I got trouble down here. Bob calls out, Whats the matter Jim? Jim shouts back, Throw me my 7-iron. You cant get out of here with an 8-iron.